This is the initial implementation. but requires more work in Sculpt and Paint modes. Not sure how many on BA were waiting for this, but there ya go. To be honest I think the new Blender keymap is good enough. I just needed left-click select and right-click menu and I’m golden. I actually quite like the Maya way of 3D view navigation and have been using it since years ago. Kinda ironic after I have spoken of “Industry Standard” in distaste on so many occasions. Still not a fan of all the hotkey for active tools. My small desire for Blender now is to have a minimalist keymap that only maps the very basic and essential functions to as few keys as possible while trying to be as logical as possible. Leaving out functions that are far too seldom used such as Dolly View. While spacebar is held down(as modifier key), hold down B to activate the tool. LMB click-drag to select and RMB click-drag to deselect. Cancel(or finish/end) the tool when B is released. Letting user simulate any key as a modifier may seem hacky, but to me, that’s one of the best quirk that made blender my favorite tool. while i use my own custom keymap that works well for my needs and i keep updating whenever there is a change, i think this one is shaping up to be a great one too…it will make many people happy including both who use left click select or who came from other softwares. This is awesome. Wish the sculpt navigation can be more like 3d coat, holding ALT is all it needs. Hi, approach and overview about ICK. Hold Alt to do what? It already uses Maya-style Alt-key navigation controls. Oh, I haven’t touched maya for a while. They are same navigations. Stupid me. Currently I think you have to manually add the operator to your own custom keymap script. It requires you to be a bit technical. Hopefully this won’t be necessary in the future. ICK it’s very good for people who need it. Personally for me, I understood when I tried ICK, what I need is just navigation like in Maya + Blender hotkeys. Because I like blender hotkeys and Maya navigation is compatible with other software that I use. And as in this video, after changing hotkeys, it was necessary to fix the conflict with already existing hotkeys. But there was a problem. These hotkeys don’t work as they should. Sometimes I need to click on a loop not 2 times, but 3 times, because 2x click does not work. 2xclick to select a Loop. Shift+2xclick to select multiple loops. Shift+3xclick to deselect multiple loops. Because shift + 2xclick does not work. To select several loops you need to press shift + 3xclick? Because shift + 2xclick does not work. Shift+3xclick to deselect multiple loops. Shift+2xclick to deselect multiple loops. How to make hot keys work as I planned, can someone help me? 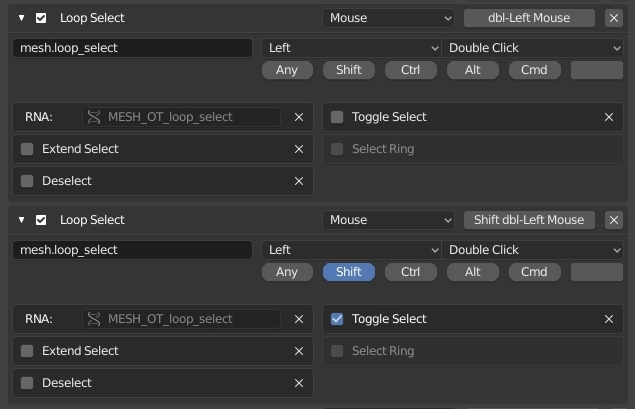 Here is my hotkeys 28 Maya Navi.py (29.3 KB) You can import it in Keymap settings. 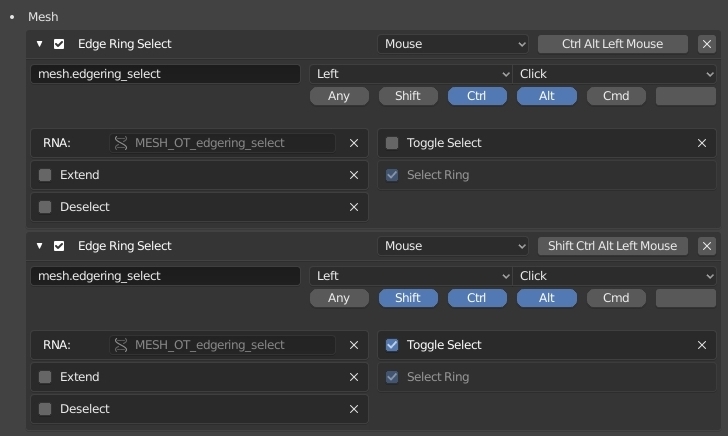 For example multiple Ring Select hotkeys to select and deselect works fine. ctrl+shift+alt+click to select, and same hotkey to deselect. The biggest problem seems to be how difficult it is to edit the Blender keymap settings, and simple things like changing what mouse buttons do, universally. I think having top-level setting for pan, rotate and zoom would help a lot. It would be application wide and affect everything.